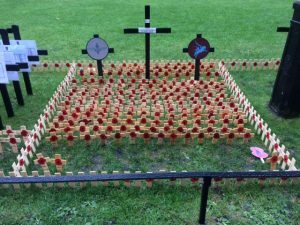 The Field of Remembrance at Westminster Abbey will be officially opened on Thursday 8 November at 11.00am. Following a request from the Metropolitan Police and Westminster Abbey, the official opening is a ticket-only event. Access to the grounds will be available from 1pm after the opening. If you are planning to visit, you are welcome to join us before 11am outside the Queen Elizabeth Conference Centre for the Two Minutes Silence. The 2017 Fields are now closed to new dedications. We will be seeking further dedications for the 2018 Field from September 2018. The Westminster Field is in the grounds of Westminster Abbey, Parliament Square, London SW1. The nearest tube stations are Westminster or St James’ Park on the Circle and District lines. Bus routes 3, 11, 12, 24, 53, 77A, 88, 148, 159, 211 and 453 all go through Parliament Square. Routes, 11, 24, 88, 148 and 211 also go along Victoria Street past the Field.